I love Google Keep. It’s a great way to quickly jot down your notes/ideas and have it sync across all of your devices that are signed in with your Google account. Expanding on the functionality of Keep, Google has added drawing tools to their Chrome app for Chromebooks which definitely ups the value of many of the new touch-capable Chromebooks that are being released by HP, Acer, ASUS, Samsung, and now Dell. Originally, a feature on Android devices for about the last year now (with performance increasing at every iteration!). 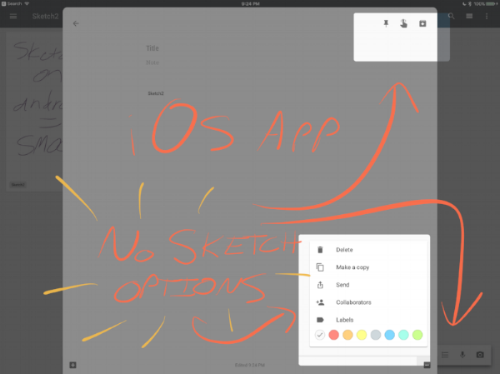 Sketching has since been added to desktop computers via a Chrome App, and now, on Chromebooks as well! With this, we’re definitely seeing the potential of Google Keep as a viable note taking app you can use daily. The only platform that I’m eagerly awaiting to receive the update is the iOS app. C’mon Google! Doodles and Sketching is a definite no go on the iOS app despite updates that included support for the iPad Pro (minus Pencil for some reason). Creating ‘doodles’ is easy! You can add a doodle by creating a "new note from drawing," selecting the pen, highlighter or marker tool and choosing from 28 colors and 6 line thicknesses. You can also add a drawing to any existing note with the "add drawing" option. As stated earlier, while sketching/doodling on a desktop works, I feel like it's less logical with a non-touchscreen device (You need to put more thought/effort into your inputs) as the input is done via the trackpad or mouse. However, I tested it on a touch capable Asus Flip and it worked equally as well with a slight lag. I could only imagine what this would be like with a stylus friendly Chromebook such as the Samsung Chromebook Pro. If you’re interested in trying out Google Keep and testing out the new features, check them out with the following links! Combined with Google’s robust search within apps and collaborative features, Keep has definitely been moving up my list of top note taking apps since I first started looking at it 3 years ago. Give it a shot! Field Trip 003: Digital Learning Day! Spring forward with new touch capable Chromebooks!